I'm hoping to revive this thread, having just picked up a copy of BWJ on ebay. 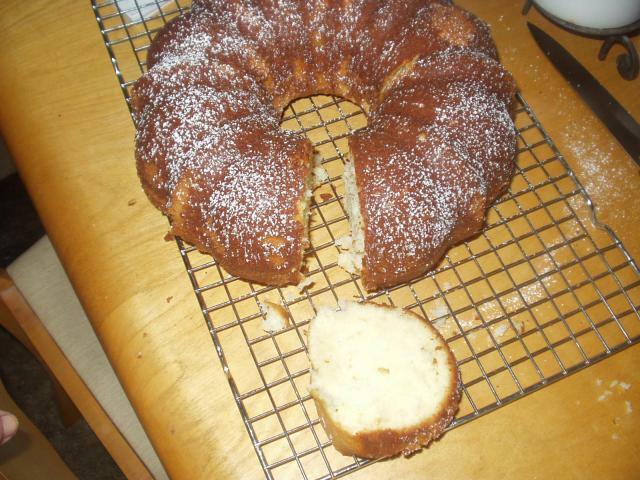 Today I baked the vanilla pound cake using 2 thatian vanilla beans and baking in a bundt pan. anyone want to bake something else? That looks really yum. Was it particularly vanilla-y having used 2 beans? I'm happy to cook more stuff from BWJ. Yes, it was filled with vanilla flavor. I bought the beans at www.saffron.com and since they were so cheap, I figured Id use two( also, they were kind of puny). My SO loved the cake, it was really lovely. I was going to make some ice cream to go with it, but we just decided to enjoy the cake's simplicity. We have a party to attend next weekend so I'd like to bake something for that. Any recommendations? I'd be up for doing some bread during the week too. I'm off to California next week so I can do anything after that for 2 weeks. btw, Im really enjoying your blog this week. Love the pictures. Oh, thanks for reading my blog! I've got to pull BWJ back out and take a look before I can suggest anything. What sort of party is it? I think I'm gonna make the potato loaves again. I just love those. Its just an after curling party( curling is some weird Canadian sport that I dont get, but which my SO plays and loves). Im thinking of making the black forest from Piere Herme's chocolate desserts, but I do have focaccia in the fridge for tomorrow. Btw, do you know if that dough can be refridgerated for more than 36hrs? I put it in the fridge last night at 11pm. I planned on making it tomorrow for dinner. Dunno whether it's Ok to keep that dough for longer than it says. It'll likely be fine, I suspect. I sorta know what curling is because my first roommate at college was from the top of Montana and therefore got a fair bit of Canadian influence. Keep me posted on your foccacia! I think I'll have to tune into the Piere Herme thread that I think I saw. Don't have the book but would love to drool over the pictures! CaliPoutine -- I think your dough should be fine after 36 hours in the fridge. You might get a stronger flavor, even a touch of a sourdough-ish taste. Let us know. Ok, I caved and Im in the proccess of baking them now. ( I have to make some turkey meatballs soon and I need the oven) I have one pizza stone so Im doing them one at a time. I had to sneak a taste and OMG, they are fabulous. Im not sure on the cuts though, I kinda winged it. Oooh, beautiful. Can I have a bite? I made the potato loaves but I can never get them shaped right. This time they "unrolled" when baking. Just wrote myself a note in the margin of my book to make sure that I pinch the seam. I'll post a picture in my foodblog and add a link here when I have it in imagegullet. I'd like to ask about dough preparation. Some nights I have the urge to start the process but it's too late to finish it all the way through. 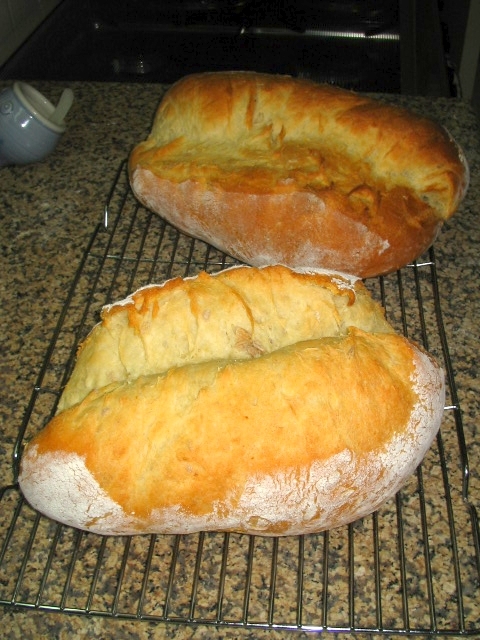 My favorite bread now is the French bread in Julia Child's The Way To Cook. The bread requires 3 rises. How and when can I put the process "on hold"? Let's say I go through the first 2 cycles of rising and punching down. Can I just wrap it in plastic, put it in the fridge and start the final rising the next day? I make the ginger cake last night. Instead of making baby cakes, I made a 10-inch cake. I haven't cut into yet, as the plan was to serve it to guests this evening, but it didn't seem to come out well so I made another cake (from Alice Medrich) as a replacement. Now, I will admit to one screw up (despite doing my mise). The cake calls for 4 eggs, adding one at a time until fully blended. I added numbers 1 -3. And I had egg #4 ready to go, but for some reason I forgot to add it to the batter. Once the eggs are in, the directions call for adding the molasses (check) and minced ginger (check) and lastly, the dry ingredients -- I was in the midst of adding them when I noticed the egg sitting in its little bowl. So, I threw the egg in mixed the batter until it was absorbed and continued with the dry ingredients. The other thing I think may have been a problem is the oven rack should have been one rung lower (the rack got shifted earlier in the day). So, the cake puffed up. And it got kind too browned around the edges. Once the cake cooled it sunk -- so there's a big depression in the middle. And it doesn't look very pretty. I know an ugly cake can taste good, but I don't think I'm going to serve it to my friends. Those potato loaves look great. Bloviatrix, how did the cake taste? I don't know much about bread making, but this is what I always do. 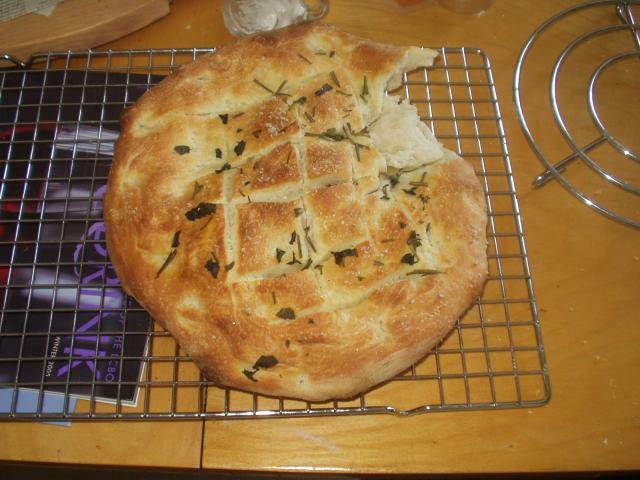 I knead the bread in the evening, throw it, covered, into the fridge, and then in the morning I punch it down and bake. Works fine for me. The cake was a total disaster. First, I couldn't get it out of the pan. I used a knife to loosen it from the sides. Banged on the bottom. Nothing. And when we finally got it out, there was a big chunk stuck to the pan. It seems the cake didn't cook all the way through. Now we're trying to figure out what caused the problems. Was it the fact I added the fourth egg late? The placement of the rack? Or that I used Healthy Balance, which is a trans-fat free margerine (I needed a parve cake for a meat meal)? I'm really happy to see this thread revived, although I'm sorry your cake worked out so poorly, Bloviatrix. I made the Best Ever Brownies this weekend. The first time I made them, about a year ago, I think I cooked them until they were pretty set, and they were great. Others who tried them at the same time ended up with brownies that were more runny than they wanted them to be, probably because Dorie's advice on the cooking time is designed to leave you with less-than-set brownies, which in her opinion taste best. This time I pulled the pan out when they were still pretty gooey, and although they firmed up a bit as they cooled, I still should have left them in the oven a bit longer. They were hard to cut into squares and I found them easiest to eat with a fork! But man, did they taste good. I've been thinking about doing the mint ganache-filled cookies (are they called Nightcaps? I don't have the book with me). I wanted to bring them to work, but I noticed that the recipe recommends serving the cookies as soon as they're made, so I guess it'll wait for the weekend. Bloviatrix -- Had you baked with Healthy Balance before? And, did you not have any problems? I don't know the product, but I do know that butter and margarine do not bake the same way. However, all in all, it sounds as though you were having a day when the kitchen goddesses were not on your side -- sorry. I'd like to jump into this thread. Have BWJ. Reading back to the beginning it seems the idea was to all bake the same thing and discuss the results. I'm going to make the potato bread and see what results I have. Any other ideas? Looked through the book and everything tempts me. I think Im going to make the pizza dough today. Id like to sub some whole wheat flour for part of the white flour. Do you all think I can do this? I would cautiously say yes, just not too much. The gluten levels are different than regular flour (I think? someone correct me if I'm wrong), and too much will screw up your dough. I don't know what the "too-much" border is - I would think that replacing 1/4 or 1/3 of the total amount of flour with whole-wheat would be fairly safe. well, i didnt make it because I wasnt sure about the ww flour. Maybe I'll wait till Dorie has a lookie at my post and can advice me. ldubois2, can't wait to hear about your experience with shaping the loaves. Please keep us posted! I made the country loaves again and haven't been that happy with the results either time. The loaves look great because I've been able to use my new bannetons but the texture's a bit dry, though I don't think I've over cooked them. And the flavour's not much of anything. Not sure what I've done wrong. I put the starter in the fridge to get more flavour and it looked and smelled wonderful before I started making the dough. I think I'll leave the recipe for now and come back to it again at some other time to give it another try. I've used it quite a bit and I still haven't made up my mind about the product. Regular margarine doesn't give the same "rise" as butter. And this mostly affects cookies -- they tend to spread out more. But, I've never noticed textural differences in cake. But the Healthy Balance is different. It's quite brittle right out of the package. I've baked with it a bit -- my gingerbread cookies came out well as did my hamentaschen. I've had mixed results in my flourless chocolate cake -- but in that case I'm not sure if the graininess was caused by something else. I'm really at loss. I prefer to bake with butter. But, because most of my entertaining is based around meat meals, if I want to serve some form of cake I need to use margarine. Thanks for the suggestion. I recently got over my fear of folding whipped egg whites into batter, so that might work.